Hey, David Judge here and today we’re going to talk about Work Hours, Holidays and the best time for a VA to work. We’re going to share how we run our team and what works best for our clients and why it works best. In today’s conversation I’m talking about the Philippines and the best hours etc. based on that location. So Let’s start with the time difference? If you’re in Australia, the difference in the Philippines is only 2 hours where for example 9:00am AEST, would translate to 7:00am Philippines time. This would obviously be different if you’re in daylight savings, or outside of East Coast? What Are The Best Work Hours And Start Times? This would usually be Monday to Friday and the type of tasks would dictate the best time for your team to start. For example, if you need someone to handle support emails and incoming calls you’d want your team to start between 8:30am to 9:00am your time. If you’re team weren’t handling those sort of tasks you may actually consider starting them a little later at let’s say 11:00am. So why 11:00am and not 9:00am? When we first started arranging VA’s for clients we found the first few hours of every day the client was following up of a number of pending and daily tasks. This would mean they wouldn’t get the maximum ‘Yield’ from their VA for the first few hours and on the flip side ended up with a number of pending tasks left over at the end of the day. So we tested what would happen if we were to shift the day to start at 11:00am. For a number of clients this worked very well, allowing the client to finish at little bit earlier (if they chose to) and for the VA to handle whatever tasks were left over at the end of the day. So in this scenario 11:00am – 7:00pm works very well for this type of client. The main point here is the start and finish times of VA’s are really quite flexible and as they are a support person within your business they understand their job is to do exactly that… Support You. Consider which model would work best for you and go from there. What Public Holidays Should I Be Aware Of? 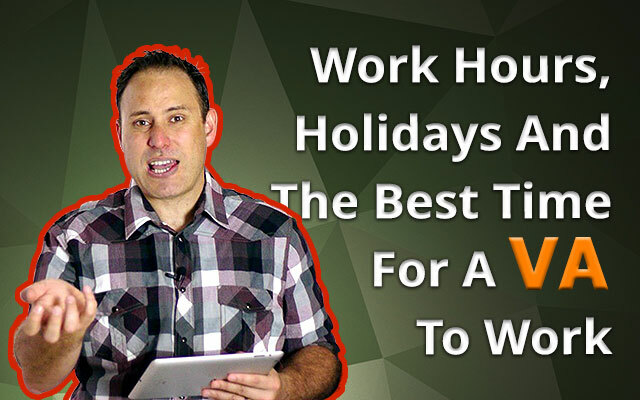 We’ve found most of the time the team all work on the other local declared holidays and if you arrange with a person in advance would be prepared to work if really necessary. If you think you would need a person to work through the major holidays ensure you position that at the very beginning to remain transparent in your business direction. To summarise on this point, for flexible hour work the key to getting the right person is to communicate it at the beginning and VA’s are really very flexible to work the hours you require. Annual Leave is another subject again, with many VA’s wanting to take the occasional group of days off, so it’s important to be mindful. This would be like 5 days from Saturday to Wednesday and for them to return to work the following Thursday. One point to encourage your VA around annual leave is for them to book it in with you as far ahead as they can. I mention that as I’ve had many a time when a VA has told me on a Friday afternoon that they want to take the next week off. I now have a method in place where my team book waaaayyy in advance if they’re taking time off. What do you do during this time? For our clients, we actually have a supervisor that overseas each team member and they are able to step in to handle any critical tasks or if required we train another person up to perform the task if it’s a critical role that a client cannot be without. One last point I wanted to mention before we wrap up is the idea of fixed start and finish times. I prefer to have fixed times (as opposed to flexi start and finish when you want) as I know when a person will be there to handle the tasks and I find people work best under a set time structure as opposed to a flexible time structure. Ok, that’s it, lets wrap up and yeah that was a lot of really valuable insights that are really never spoken of in our industry. In the next session we’re going to discuss ‘How and when you should upskill a VA’. This will be really great as there are a few methods of crowd upskilling that we’ll cover.